(Figure 11.8c). Basal sliding was allowed only over the latter and only when the bed was at the pressure melting point. With sliding, the balance velocity (Equation (5.1)) is reached with thinner ice and a lower driving stress (pgha). Note the progressive isostatic depression of the bed as the ice advances (Figure 11.8b) and the acceleration of the advance over the soft deformable bed (Figure 11.8c). Figures 11.8d and 11.8e show the maximum thickness of the permafrost and the width (measured along the flowline) of the submarginal frozen zone (see Figure 6.16). The permafrost is thickest when the glacier margin first reaches a given place on the landscape, and then thins as the ice cover thickens and insulates the site from the climate. The initial increase in maximum thickness is a response to the cooling climate (Figure 11.8a). The subsequent decrease from about 35 to 30 ka (Figure 11.8d) is a delayed reaction to the climatic amelioration that began at 40 ka. The width of the subglacial frozen zone reflects a balance between the rate of increase in width as the ice sheet advances over permafrost and the rate of decrease in width as the upglacier edge of the permafrost thaws. Changes in width thus result from a combination of changes in rate of advance and changes in climate: the decrease in rate of advance at ~38 ka (Figure 11.8c) results in a decrease in width (Figure 11.8e), and the increase in rate of advance at ~30 ka results in an increase in width. The abrupt ~70 km decrease in width at ~42 ka is puzzling, but both it and the abruptness of the decrease at 35 ka suggest that at the upglacier edge there was a wide zone of relatively thin permafrost that disappeared nearly simultaneously. Cutler et al. (2000) reach three basic conclusions from this study. • Permafrost persists for time spans of order 102—103 years beneath an advancing ice margin. • The maximum width of the submarginal permafrost zone is of order 102 km. • Submarginal permafrost severely inhibits drainage of basal meltwater, leading to high subglacial water pressures. Although the dimensions of the permafrost layer (as well as many other model results) are sensitive to the values of the parameters used to define the climate, substrate characteristics, and sliding speed, these results appear to be robust; the modeled Late Glacial Maximum (LGM) ice sheet had a wide, persistent frozen toe with all tested values of the parameters. A caveat is that in their sensitivity studies Cutler et al. varied only one input parameter at a time. Their conclusion would be stronger if they had varied two or more parameters simultaneously in a direction to minimize the width of the frozen zone. The probable existence of such a frozen margin during the LGM has several geomorphic implications. • As the width of the frozen margin decreases, rather abrupt releases of stored subglacial water are likely. This supports the authors' hypothesis that tunnel valleys found along the LGM margin in Wisconsin were formed by such drainage. 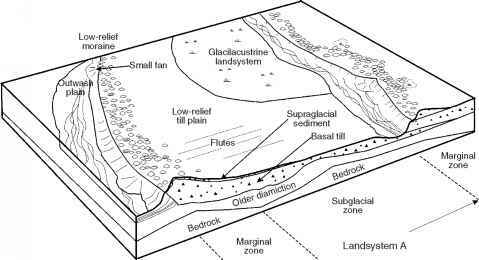 • High subglacial water pressures are likely, so landforms associated with deforming beds are to be expected. Bands of drumlins upglacier from the presumed zone of frozen bed in Wisconsin (Attig et al, 1989) are consistent with this, inasmuch as a mobile substrate appears to be an essential requirement for drumlin formation (Patterson and Hooke, 1995). • Thrust features formed by the mechanism discussed in Chapter 6 (Figure 6.16) might be expected but somewhat surprisingly are not found in Wisconsin. Such features are present at comparable latitudes in neighboring states. • Large proglacial lakes like those that formed between the advancing ice margin and the southern shores of Lakes Michigan and Erie would have inhibited formation of submarginal permafrost. This may explain, in part, why features such as drumlins, thrust features, and tunnel valleys are rare or absent south of these lakes, but higher marginal temperatures would also be a factor. It may also explain why ice lobes that filled these lakes extended further south. While glacial geologists had speculated that permafrost might persist for some time under the margins of advancing continental ice sheets (see, for example, Mickelson, 1987), numerical modeling such as that carried out by Cutler et al. provides a much firmer theoretical basis for this speculation.